For dressing, whisk together olive oil, lemon juice, honey, 1 tbsp walnuts (finely chopped), and salt and pepper. Set aside. Assemble lettuce onto four plates. 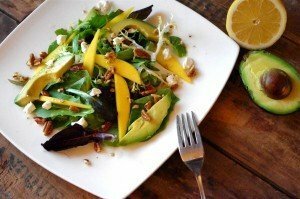 Top with thinly sliced avocado and mango. Sprinkle with chopped walnuts and crumbles of goat cheese.